» Benchmade Barrage Review – Is This Knife Worth the Money? 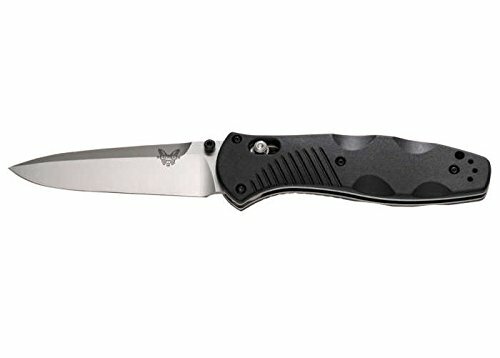 Benchmade Barrage Review – Is This Knife Worth the Money? There’s an old saying along the lines of if the only tool you have is a hammer, every problem looks like a nail. There’s no such thing as a tool that’s suited for every task you’ll encounter in a busy life, after all. But before you start looking for an everyday carry toolbox there is one tool that comes close, and that’s a good knife. A high quality blade will come in handy more than just about any other item you could carry. If you find yourself in a survival situation it can help you obtain all the essentials – shelter, fire, even water and food. That’s because with a knife you can make things. Do some internet research on knives and you’ll find there are as many opinions about what one’s best as there are people who use knives. Any discussion about what blade is best quickly throws out a lot of dissenting views. 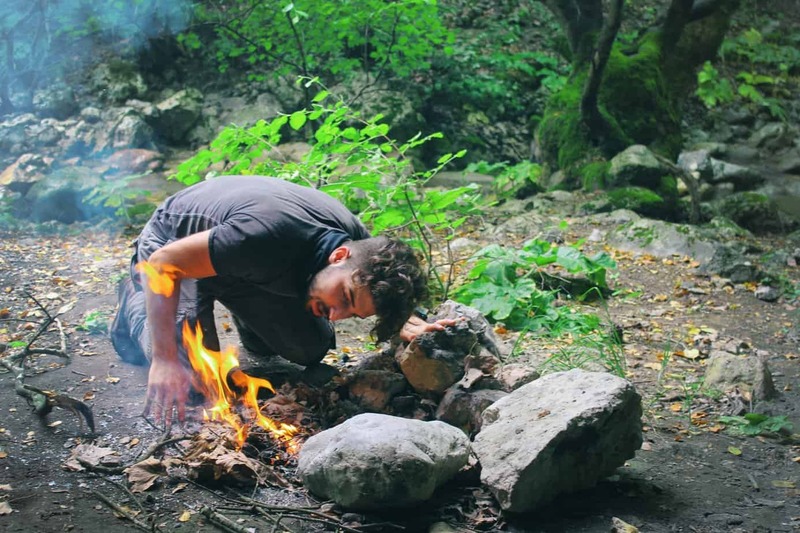 Then of course there’s the question, “Best for what?” The knife you want in your hand as you split firewood and battle grizzly bears in the woods might not be ideal if you just want something you can slip in your pocket every time you go out. But then again it might. Everyday carry is now accepted as a category of knife, and it’s just what the name suggests – a blade you can always have with you and that’s capable of dealing with everyday jobs. If it’s a quality tool there’s no reason why it wouldn’t be just as good for outdoor sports as it is for opening boxes at work. Obviously an EDC knife is going to be compact enough to carry in a pocket, and won’t be up to heavy duty chopping, but most outdoorsmen carry a razor-sharp folder for precise work and a belt knife, machete or even ax to handle the heavy stuff. So an EDC knife doesn’t have to be capable of doing everything, just the tasks you’re likely to face often. That lets you pick something that fits easily in a pocket but is still large enough to be worth having – and that pretty much means a folder. There are a few fixed blade knives that work well for EDC, but the basic design has limitations – the need to have the blade and handle large enough to be useful means they’re usually too large to be carried discreetly and comfortably. If you’re a fisherman and can carry a knife on your belt that’s fine, but for most of us this isn’t an option. Blade length. Too large and you risk it not being practical for EDC; too small and the blade won’t be up to many common cutting tasks. Most EDC knives have blades between 2.5 and four inches long. Blade shape. The most important thing about any knife is that it has a good cutting edge, but shape can make a difference too. Tantō and sheep’s foot blades have very strong tips that can take a lot of stress, but they aren’t so good for piercing. Drop and clip point blades give up some strength in exchange for a finer point that’s excellent for fine carving. Spear points are probably the best for piercing. It doesn’t matter how outstanding the blade design is if it isn’t made of quality metal. Traditionally, high carbon steel has taken and held the best edge, but it’s prone to rust and needs regular maintenance. Some modern stainless steels are almost as good, and they’re a lot easier to look after. Generally a stainless blade is your best option. Handle material. This is very subjective; some people like natural materials like wood or horn. Others prefer metal or synthetics. Like the shape of the handle, most of it comes down to what you personally like. Whatever you’re looking for there are still probably hundreds of knives that fit the bill, but if you’re finding it hard to choose you probably won’t go wrong with a Benchmade. This company has a wide range of excellent knives, and one of the most popular is their Barrage series. Like many Benchmade knives there’s a whole series of Barrage models. In fact there are five options, three full-size (two with drop point blades and a modified tantō) and two mini versions (both drop point). Here we’ll look mainly at the 580, a full size drop point. The 580 Barrage is a high end folder with a price tag of around $200 as of this writing (For the latest prices and discounts, check here), although some shopping around should get you one for under $130. For this you get a tool that’s made of top quality materials throughout and put together with a standard of workmanship that just can’t be criticized. 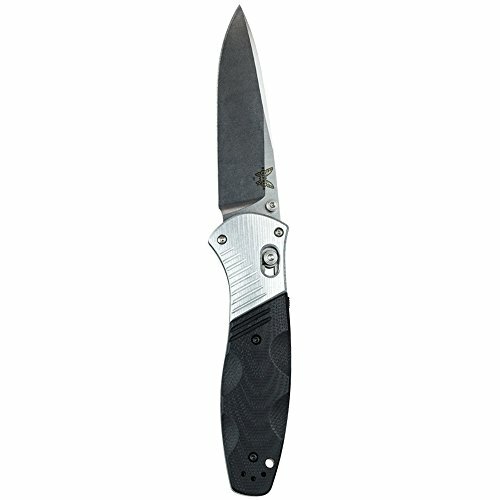 It was designed for Benchmade by Warren Osborne and it’s one of the company’s best-selling knives. Weighing in at 4.2 ounces, and with a closed length of 4.75 inches, the Barrage sneaks in at the upper end of the EDC bracket. When opened that expands to 8.35 inches, and a very useful 3.6 inches of that is blade. It’s quite a chunky knife, with a big handle that gives an excellent grip, but it’s immaculately balanced and extremely comfortable in the hand. The handle scales on the 580 are molded from Valox. They’re well shaped for grip, quite full in the center – this knife fills your hand much better than many slimline folders do. The surface is lightly textured and there are grooves and cutouts molded in to prevent any slippage. The front of the handle also flares out nicely on the bottom to keep your hand off the edge. Some people might find it too bulky for EDC but that bulk comes with enhanced usability and comfort, so it seems like a reasonable price to pay. Inside the handle are stainless steel liners, with some small cutouts to reduce weight slightly. Overall it feels very strongly constructed and the fit of parts is excellent. Poking around inside you’ll also find the Barrage’s version of the Axis Lock. This is pretty much a standard feature on Benchmade folders, but the Barrage adds an assist spring. The result is a knife that’s extremely fast and easy to open; just get it started with the ambidextrous thumb stud and the blade will snap positively into place. The handle also has a couple of retention options. There’s a lanyard hole at the pommel end, and a sturdy pocket clip. This can be swapped to either side of the handle for ambidextrous carry, by removing three screws, but it only allows for tip-up carry. There’s no way to set it up for tip-down, probably because it would get in the way of the lock. The blade is one of the nicest you’ll find on a folder. It’s forged from 154CM stainless and is available either natural or with a black Cerakote finish. You can also choose between a straight edge and one with a serrated rope cutter section at the rear. The blade is slightly unusual; it’s a drop point, but the back is ground down slightly to create a false edge for most of its length. That gives many of the benefits of a spear point tip, without weakening the blade – it has a very substantial 3mm spine to give it a core of strength. Out of the box it’s razor sharp, and holds its edge very well too. One nice thing about 154CM is that although it’s an extremely tough steel it’s also easy to sharpen, but you won’t need to do it too often anyway. Benchmade has come up with a blade that’s extremely versatile. The point is fine enough for delicate work and has a huge piercing ability, while the profile gives it the strength for heavier work. The false edge doesn’t extend all the way to the pivot so there’s a thumb ramp if you need to apply more control. One minor gripe is that this doesn’t have any jimping, so if your hands are wet it can be quite slippery, but this isn’t a big deal considering how excellent the blade is in every other way. There are other options, though. The 581 Barrage is a more conventional drop point made from M390 steel, and uses G10 for the handle with aluminum bolsters. The 583 has a modified tantō blade with a clipped point, while the 585 and 586 are mini versions of the two drop point models. If you’re in the market for a high-end folder there’s something in the Barrage range that will suit you. Verdict: An excellent knife that combines top class materials and design genius to produce a very versatile tool. 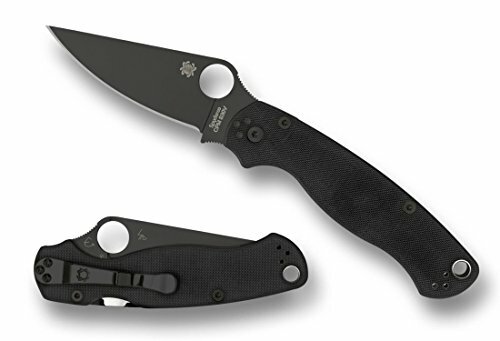 Spyderco Paramilitary 2 – With a G10 handle and S30V blade, this is slightly lighter and slimmer than the Barrage but doesn’t give away anything in quality. Read my full review here. 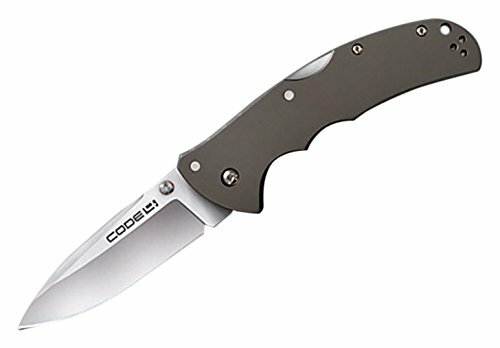 Cold Steel Code 4 – Available in clip or spear point style, the Code 4 is ideal for anyone who prefers a traditional lever lock to the Axis system. It’s also an extremely solid all-metal knife with a comfortable aluminum handle.